PHSO – can a dysfunctional organisation reform itself? Jeremy Hunt, the Health Minister used the Sunday Times to share his rebuke of Dame Julie Mellor, Parliamentary and Health Service Ombudsman for insensitive treatment of bereaved families when dealing with their NHS complaints. It is unusual for a Minister to publicly criticise the Ombudsman, an organisation set up to be independent and effectively self-governing. Mr. Hunt however felt so strongly that he has referred the matter to PACAC, the Public Administration and Constitutional Affairs Committee who monitor the work of the Ombudsman service. He has demanded that Mellor make an unreserved apology to Titcombe and other bereaved families and has referred the ombudsman to the Commons public administration and constitutional affairs committee. There is a good deal of finger wagging going on here, but as neither PACAC nor Mr. Hunt have the power to take any direct action it will be down to the Ombudsman and her team to put the matter right. The blind leading the short-sighted. due to its own dysfunction. The first step to reform is insight into your own strengths and weaknesses. 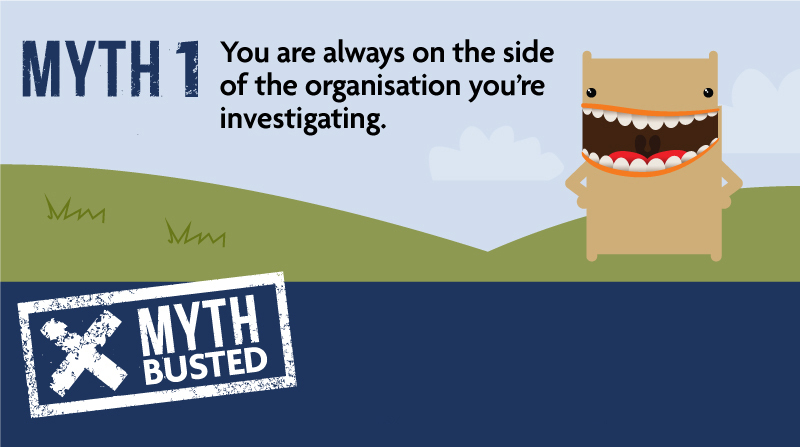 This is sadly lacking at PHSO where recent negative feedback, collected in preparation for a new service charter, has been dismissed as delusional myth in their new #mythbusting project. Apparently you can make all the bad comments go away by using a toothy cartoon monster to cut them down to size. Narcissistic: When management (individual or as a whole) is obsessed with their individual success, it is a huge red flag. To lead, management must serve those on the front line. Upon driving performance, management will get their due recognition. However, when the sole purpose is to feed the ego and support the growth of management you can count on rampant dysfunction and less then desirable results. When you start making up titles like, ‘Director of Strategy and Insight’ and ‘Director of Quality and Service Integrity’ you are verging on farce. Complex management structures diffuse decision making and accountability, resulting in no-one having the least idea who is responsible for what. Non-Committal: Strategy of the week, the day or the hour? It is a terrible feeling for an employee to feel like their direction is changing faster than the weather in Chicago. While change can be adapted more rapidly in a stronger culture, in a weak or dysfunctional culture the fragile nature of the employees can be broken by even positive change. Both the Director of Strategy and Insight and the Director of Quality and Service Integrity were present at a recent PHSO meeting (April 2015) where staff concerns were discussed. Staff want us to respond more robustly to the external criticism and ‘fight our corner’. It is perplexing to find that the staff at phso do not understand how the new method and approach work given that they have been part of this change programme since 2013. Sharing a common understanding should be the starting point, not the end point. Not to worry though as the Director of Quality and Service Integrity is able to clarify the situation. The Director of Quality & Service Integrity presented his paper to the Board and advised that the underlying rationale for the Integrated Change Programme is that staff often feel that change is ad hoc and unplanned (even when there has been sound planning), so there is a need for something that is explicitly and demonstrably cohesive and integrated. Quality – we need to be sure what we’re trying to do before we can assess whether we’ve achieved it. Turn-Over: Are you seeing a revolving door of people coming and going? This is a really bad sign and something that needs to be quickly rectified. If employees are leaving, whether by choice or not, then you can be fairly certain that management is dysfunctional. Hiring is never an exact science and the elimination of low performers is important. However, companies with high turn-over are often seeing this due to weak culture and poor leadership. The rapid change of people is a Band-Aid by management to cover up for a much bigger problem which they can find in the mirror. Passive-Aggressive: Whether it is showing up late to meetings, forgetting to share important details, or consistent excuses for not getting things done. These behaviors are damaging in all cases. For instance, the late arrival to a meeting once can be an accident. Regularly showing up late is a sign of indifference and can likely be a sign that the person doesn’t care about or for what the meeting is about. In strong cultures this behavior is nipped in the bud, but in a dysfunctional environment this can be seen throughout the workplace. Failure to meet deadlines is a common occurrence at PHSO. At the end of the financial year, they release their annual report and accounts. Each year the wait for the data grows increasingly longer. According to the April minutes the first draft was ready in early May. It is now September and the final draft has yet to emerge from the intricate layers of management and bureaucracy. Mr. Hunt was right to point out that PHSO was failing to deliver a humane complaints system. It is also failing to investigate complaints in any robust manner, failing to improve service delivery and regularly failing to deliver to an agreed time scale. If PHSO were a failing school the government would not hesitate to remove the entire management team within a week. Words are good Mr. Hunt, action is better. Previous Previous post: The system rules ok.
As I understand it, only a judge and, on a resolution of “both” Houses of Parliament to remove the Ombudsman from Office have power to “order’ her to do anything. No SoS has powers over her as that would interfere with her “independence”. So, I wonder whether Hunt is doing this deliberately to create a stand-off to force Parliament’s hand ? If DJM cedes to Hunt’s “order” her “independence” will be compromised and it’ll set a precedent that will have far-reaching consequences. It’s going to be interesting to watch how this one plays out. I certainly welcome the SoS’s intervention. You are right Elaine. In order to protect parliament from the fall out of complaint handling they set up an ‘independent’ body leaving them with clean hands. Now they have no direct control, but most probably plenty of political influence over the working of the Ombudsman. This should be a wake up call to the Cabinet Office who are currently drafting new legislation for the introduction of the Public Service Ombudsman. They are looking at leaving the total discretion the same and not interfering with the independence enjoyed by the Ombudsman service. This will not restore public confidence as the complainants are looking for accountability. New name, same game will not wash. The Cabinet Office would have been as well digging into their archives and retrieving it rather than squandering resources on the Gordon report and related on-going initiatives than pretend they’re conducting a de novo review to reform the legislation. Nothing has been advanced since 1999. We’re still marching time. Disgraceful. ” 6. In 1999 a review based upon the ombudsmen paper was initiated by the Government ….. We supported the creation of a single commission, which should be “the key objective of any reform process”. We criticised the MP filter as an idea which had outlived its time, and recommended that it should be replaced by direct public access. We endorsed the calls for a thorough review of the jurisdiction and powers of the Ombudsman, with an emphasis on increasing rather than reducing those powers. In conclusion we urged that the programme of reform should not be allowed to slip, adding that “We hope that restrictions on parliamentary time will not prevent an early opportunity being found for this important legislation to be enacted. It will bring important benefits to the public and should be seen as an integral element of the Government’s programme of public service and modernisation”. 16 years and still no progress. Shocking! When will Parliament rid the public of this dreadful organisation? According to its latest accounts 2013/14, its capital and resources budget, courtesy of taxpayers, many of whom have been subjected to its callousness, was £36m. comment-page-1/#comment-1744 on what can only be construed as the sham of the current “review” of the Ombudsman legislation. It is nothing but a regurgitation of what was known and recommended in 1999. What is wrong with Parliament that since 1999, to the on-going detriment of citizen complainants, it has been unable to get its act together to fix both procedural and substantive problems relating to the Ombudsman? After “irrelevancy” in the last paragraph I ought to have qualified that descriptor with the words “to complaints”. In contrast, public authorities guilty of wrongdoing no doubt consider that the £36m annual spend is extremely good value for money to cover up wrongdoing. ” I have noted your comments about the PHSO and the current review of the ombudsman legislation. However, the Committee does not have oversight of this process. When the draft Bill is published, it will be open to you to contact your local MP to ask them to make representations on your behalf regarding the proposed legislation. I hope that is helpful”. If PACAC answer those questions I will duly post. A very good point Elaine. It would appear that the Cabinet Office are aiming to tick the ‘public consultation’ box for the new legislation whilst at the same time limiting the scope through an MP filter. Many in our group have found our MP to be less than helpful – will it be any different if we write to them again on this matter? This is a clear move to contain the voice of the people by intercepting it through parliamentarians who are controlled by the party whip.